I was in the parking lot of a bowling alley when I first heard about the incident in front of the Lincoln Memorial involving Covington Catholic High School students and a Native American elder. It was supposed to be a pretty fun day, but the scowl on my dad’s face when he showed me his phone warned me that I was about to have my mood trampled on. The “Jackie” in question is one of my dad’s best friends, a Navajo woman who I’ve always known to be very in touch with her heritage. Her family history is such a huge part of her character that I could already infer that she was furious the moment that I saw the video. Given the information that we had at the time – a video showing a crowd of white kids in “Make America Great Again” hats circling around one Native American man, followed by seemingly trustworthy accounts that the teens were chanting, ‘Build that wall’ – I couldn’t blame Miss Jackie for being appalled, nor my dad for being spreading the information to me. But they had both been suckered into the outrage, and I had been suckered too. The confrontation in Washington D.C. took place on Friday, Jan. 18, and the following Saturday was subject to countless tweets and articles lambasting these students for their actions. By the end of Sunday, however, the story had changed immensely. More videos began to emerge from Friday’s marches, and the more we saw, the less those Covington Catholic High School students looked like the biggest issue at hand. One day there was a Native elder being mobbed, then less than 24 hours later, we get a man and some Catholic students. The clear line between the heroes and the villain was blurred, and that’s because the story wasn’t as simple as we were led to believe. 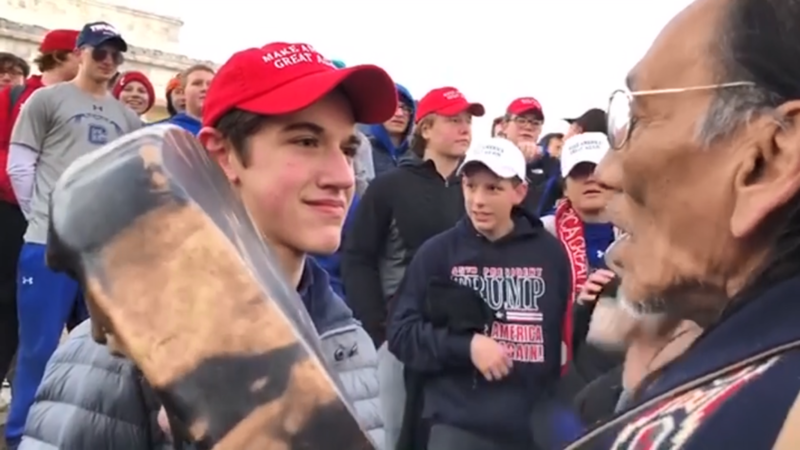 Nick Sandmann, the Covington Catholic High School student seen smirking at Omaha elder Nathan Phillips in the video, mentioned during his accounts of the incident that he never heard anyone chanting, “Build that wall.” This chant wasn’t present in the original video, nor was it apparent in any of the videos that were uploaded after the fact. What was found in future videos, however, was a torrent of slurs and insults being heaved at the high school students by another group that was marching in D.C. that day, the Black Hebrew Israelites. The Covington Catholic students were attempting to drown out the taunts by shouting their own high school chants, and Phillips was trying to enter the crowd and calm down both parties. The question on everyone’s minds since the incident has been, “Who’s to blame?” Sandmann for smirking at Phillips? Phillips for beating his drum in Sandmann’s face? The Black Hebrew Israelites for instigating the yelling from all sides? I think everyone involved did something that contributed to things getting lost in translation, but the biggest culprit of all as far as I’m concerned are the news and social media sites that allowed misinformation to spread across the internet like wildfire. As soon as the original video went viral, news sites and channels quickly picked their sides and jumped to give their take on the situation. The New York Times said that the students mobbed the Native elder. Fox News’ first article on the matter mentioned an apology form the Catholic diocese in the headline. CNN called the protest weekend a “Rorschach test,” which is honestly the best way I’ve seen it described. What makes the CNN article interesting to me is that it was the first one that I found on the site, yet it was uploaded on Jan. 22, three days after the incident occurred. When they call it a Rorschach test – referring to the fact that everyone is looking at the story a different way – they’re acknowledging that the story had run wild in the days preceding this post. Unless the search engine on CNN.com is hiding information from me, however, CNN did not contribute to the mishandling of this story on their website. They took their time. Waiting a moment before hopping onto a story is something that I wish all news providers would do, though I know why it isn’t the case. For a lot of companies, being the first to get to a story and profit from it is so valuable that it trumps the need to allow things to develop. While I understand this, I do think that rushing into stories like this actively harms our society. In a guest appearance on episode 115 of the podcast “SuperMegaCast,” singer and YouTube personality Dan Avidan spent a few minutes tackling his hatred of 24-hour news networks for this very reason. Before I joined The Seahawk, I shared his disdain for the news, feeling it was too negative. Since I began writing for the paper in October 2018, however, I’ve realized that the reason news outlets spew so much negativity out there is so that people can be warned about what’s wrong and keep from repeating these same horrid actions they don’t want to read about. The very nature of what the news means is that it has to highlight negative stories, but even more than that, the news needs to be accurate. With the way that the system is set up right now, the biggest reporters out there are not in a position to maintain the necessary level of care, and they really should be. Tags: Convington Catholic High School, Nathan Phillips, news outlets, Nick Sandmann, Washington D.C.